I wanted to make a chicken and mushroom pie for some friends, but one of them was a vegetarian, so I used all the vegetables I had available to me and the pie was delicious. Take a large deep frying pan and add a little olive oil. 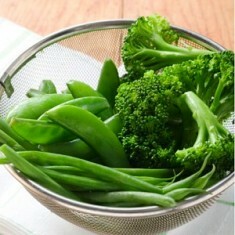 Tip in all the vegetables you have chosen and prepared, and gently cook for 4-5 minutes. Add a pot of creme fraiche, and then make some vegetable stock in the creme fraiche pot and add that too (do this twice). Season with salt and pepper, and add half a teaspoon of mustard. Mix the whole thing and let it bubble gently for another 5 minutes. Roll out a sheet of shop bought puff pastry and lightly score it. Tip the vegetable mix into a rectangular pyrex dish, and lay the sheet of pastry on top - tucking it in at the edges. Beat a small egg and brush it all over the pastry. If you don't have a pastry brush, you can use kitchen roll to smear the egg over the pastry. Cook in the oven at 190C for about 35 minutes. Take it out when the pastry is golden and slightly crisp. The pie should be enough for 8 people and is lovely with mashed potato.